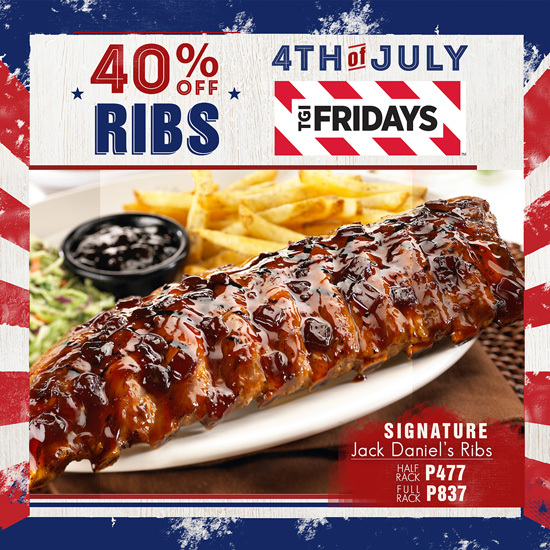 Hello there my dear friends!TGIFriday's here in Davao City is pleased to let you know that they will be offering yet again another rock bottom, 40% mark down on their all-time signature Jack Daniel's Ribs this FOURTH OF JULY! Other than the mouth-watering ribs, TGIFriday's also have a good list of delicious food, perfect to celebrate our American friends' Independence Day! See you all at TGIF! Hello Ronald, thank you for dropping by, anytime! You are most welcome!